And children may need X-rays more frequently than adults because their jaws and teeth are still growing and their teeth are more likely to be damaged by tooth decay. But the use of X-rays, which use radiation to generate an image, raises the question of how safe dental X-rays are, particularly for children. 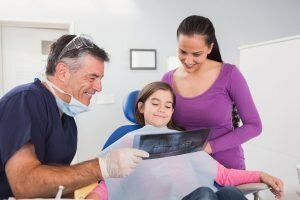 So that you know the facts about dental X-rays for children, and the risks involved, Cardiff Dental is taking this chance to explain dental X-rays, their pros and cons, and how we use them. X-rays are a common imaging test that allows dentists and physicians to see teeth, bones, and organs within the body. Overall, X-rays are quick, painless, and safe, particularly when compared to other methods of examining teeth, bones, and internal organs. X-ray beams, beams of a specific kind of radiation, pass through the body and strike a film plate on the other side of the body. The result is a black and white image of the inside of the body that can be viewed by your dentist. During the X-ray, your child will not feel anything unusual, although they may feel awkward or uncomfortable because of the way he or she must sit, the use of dental tools, and the requirement for immobility. Children are more sensitive to radiation exposure than adults are, which means the cancer risk per dose of radiation is also higher for children. Children are smaller than adults, so their organs (e.g. the thyroid) are closer to the spot of the X-ray. It’s not the radiation from a single x-ray that is likely to lead to cancer – it’s the accumulation of radiation exposure built up over a lifetime. The younger a child is when they have an x-ray, the longer the amount of time there is for radiation exposure to lead to cancer. How much radiation are we talking about? First, it’s important to take into account that we are constantly exposed to natural radiation. Radiation literally rains down on us from outer space, and there are elements in the earth that produce a steady stream of radiation. Depending on where you live and travel on our planet, you receive between 3,000 and 4,000 micro-Sieverts of radiation annually. In contrast to this, you receive a relatively small dose of 8 to 9 micro-Sieverts for each intraoral X-ray, if your dentist is using fast-speed film or digital imaging. A dentist could take a ‘panoramic’ X-ray, which encompasses the entire mouth area. This increases the radiation exposure to about 24 micro-Sieverts. The amount of radiation exposure dental X-rays is relatively minor – particularly when compared with radiation you receive from natural sources. So, the radiation exposure from dental X-rays is small, but it does exist and must be considered in treatment. Make sure it’s the dentist recommending an X-ray, not the staff performing it on a schedule. Many dental offices have dates for when to take x-rays, such annually or bi-annually, and this does not always follow the guidelines of ALARA (as low as reasonably achievable). An example of a good reason to take an X-ray is if your dentist already suspects there is a hidden cavity. In this case, the X-ray prevents worse harm, which is not identifying the cavity and possibly losing the tooth. How does Cardiff approach X-rays? 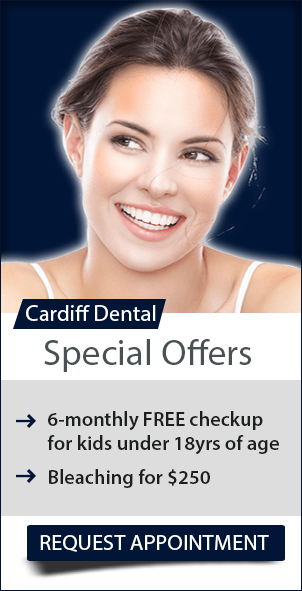 At Cardiff Dental we believe the safest approach is to follow the ALARA principle, which stands for “As Low As Reasonably Achievable.” Minimise a child’s exposure to x-rays as much as is possible, but it is also necessary to understand there may be occasions on which X-rays are necessary and beneficial. Additionally, because digital X-rays are much faster and easier to use, and in recent years have become more reliable and increased in visual quality, at Cardiff Dental we use these state-of-the-art digital X-ray machines.